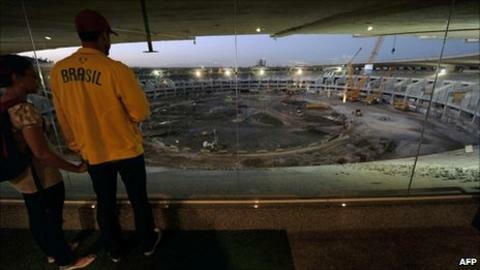 Brazilian Minister of Sports Orlando Silva has promised that all 12 stadiums for the 2014 World Cup finals will be ready by the end of 2013. There have been severe delays in all 12 cities chosen to stage the matches. But Silva said: "Brazil will be ready as agreed with [world governing body] Fifa in terms of infrastructure." He added: "Eight stadiums will be ready by the end of 2012; 10 by the start of the Confederations Cup in 2013; and all 12 by the end of 2013." Most of the planned investments for the World Cup are state-sponsored with federal and local governments in Brazil pledging $13bn (£8bn) to boost the country's infrastructure. The bulk of the money - $6.4bn (£3.93bn) - will be spent on much-needed upgrades in the public transport systems of the host cities with the hope that the investment in the tournament will have long-lasting effects on people's lives. "Most of these investments will translate into a legacy for the Brazil population after the World Cup," stated Silva, who hopes the 2014 event could create 700,000 new jobs. However, the Brazilian minister of sports revealed that the cost per seat for all 12 stadiums had risen to $7,000 (£4,300), which he attributed to the "strong expansion of the Brazilian economy". The cost per seat for the recent construction of Primera Liga outfit Espanyol's new stadium in Barcelona was £1,630. "Fifa's requirements for the World Cup also have had an impact on costs - for example telecommunications - and that has an effect on the cost of the stadiums," Silva said. Fifa executives will travel to Brazil next week for the qualifying draw for the 2014 finals and will see at first hand what work has been done. "Fifa will see the progress that has been made," added Silva, who declined to answer a question as to how much Fifa was projected to make from the 2014 event. Silva also dismissed concerns over how crime could threaten the safety of the 600,000 visitors who are expected to visit Brazil during the tournament. "The minister of justice is currently coordinating a plan for security for the World Cup," said Silva. "Local police forces in the states and the cities will be supported by the Brazilian armed forces and the strong integration of security agencies from all over the world - we've had a very postive dialogue with them. "We are working very hard to make sure visitors will be safe - because we want them to come back many times. We will indeed have a safe World Cup." The qualifying draw for the 2014 tournament is due to be held on 30 July in Rio de Janeiro, which will also host the Olympic Games in 2016.